Harry the Viking sailed home on Sunday to land the £40,000 Persimmon Homes Scottish Borders National at Kelso’s richest race day of the season. His successful raid gave Greenlaw trainer Sandy Thomson his third consecutive win in the contest, and Selkirk jockey Rachael McDonald the biggest win of her career. The 5-1 chance proved his stamina to record his first success since 2011 with a gutsy performance in the four-mile marathon. “It´s fabulous to win this race again,” said the Lambden-based trainer, who won the 2014 and 2015 Borders Nationals with Neptune Equester. A £14,000 purchase from Goffs Sales in 2014, Harry the Viking had been aimed at the prestigious title, following the untimely death of his stablemate. “When he died we decided that this race had to be the target for Harry the Viking,” said Sandy,” and for a change the handicapper gave us a chance. In a drama-packed race, Scotswell crashed out at the first, while Grove Silver fell five out, bringing down Millicent Silver. Brian Hughes has been in unbeatable form and was again the man to follow, riding three winners at the well-supported festive family fixture. He took the opening Black Swan Kelso novices’ hurdle race on Malcolm Jefferson’s hot favourite Mount Mews. Unbeaten in bumpers, the winner was making a victorious hurdling debut to hold Sam Spinner by four lengths. “He didn´t really like the tacky ground as he´s such a good mover and we could have done with a bit of rain,” said the Malton trainer. “He´ll tell us where to go next but he will be sticking to novice company for the time being,” he added. The Hughes/Jefferson partnership was also successful an hour later when Kelka headed the Iain Livingstone 60 th Birthday mares’ novices’ hurdle race. She cruised home seven lengths clear of Oscar’s Prospect. “She´s a decent type and we are aiming her at a mares’ event at Haydock later in the month,” said Jefferson. Brian Hughes completed his hattrick in comfortable style, when 3-1 chance Gas Line Boy was the 11-length winner of the Scotty Brand Veterans’ handicap chase. The John Wade Group Paris Pike novices’ chase also went to a southern raider, when Aux Ptits Soins was another winning favourite for Paul Nicholls. Runner-up at Exeter on his chasing debut, he was stepped up in trip to score by a length. “The idea was to bring him here to give him more experience and there are no plans for him at present,” explained Nicholls’ assistant Andrew Doyle. Nicky Richards rarely leaves Kelso without a winner, and saddled the longest priced winner of the afternoon when One for Hocky posted a 9-1 success in the Happy 70 th Berwick Speedway’s Dennis McCleary handicap hurdle race. “I didn´t expect them to finish that way round,” conceded the Greystoke trainer, who also had the second-placed favourite Caius Marcius. Fourteen went to post in the concluding Kristoffersen Carpets & Flooring novices’ handicap hurdle race, won by newcomer Bako De La Saulaie, ridden by Hawick jockey Craig Nichol. 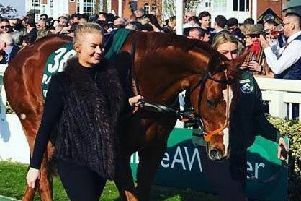 Runner-up in an Irish maiden point-to- point, the five-year- old is trained at Alnwick by Rose Dobbin for her parents Sarah and Duncan Davidson. “He is a lovely horse and I can´t wait for him to go chasing,” enthused the trainer’s husband, Tony. Racing returns to Kelso on Thursday, December 29. RESULTS: 12.20 – MOUNT MEWS (B Hughes) 8-15 fav; 2, Sam Spinner 9-4; 3, Katalystic 66-1. 14 ran. M Jefferson, Malton. 12.50 – AUX PTITS SOINS (S Bowen) 6-4 fav; 2, Westren Warrior 9-4; 3, The Dutchman 5-1. Five ran. P Nicholls, Somerset. 1.20 – KELKA (B Hughes) 1-5 fav; 2, Oscar’s Prospect 7-1; 3, Moscanisi 28-1. Six ran. M Jefferson. 1.50 – ONE FOR HOCKY (R Day) 9-1; 2, Caius Marcius 7-2 fav; 3, Sudski Star 66-1. 14 ran. N Richards, Greystoke. 2.20 – HARRY THE VIKING (Miss R McDonald) 5-1; 2, Carrigdhoun 18-1; 3,Itstimeforapint 33-1. 11 ran. A Thomson, Greenlaw. 2.50 – GAS LINE BOY (B Hughes) 3-1; 2, Cloudy Too 9-1; 3, Jet Master 16-1. Eight ran. I Williams, Worcs. 3.20 – BAKO DE LA SAULAIE (C Nichol) 13-1; 2, Late Date 11-2; 3, Paddy’s Yarn 66-1. 14 ran. R Dobbin, Alnwick.